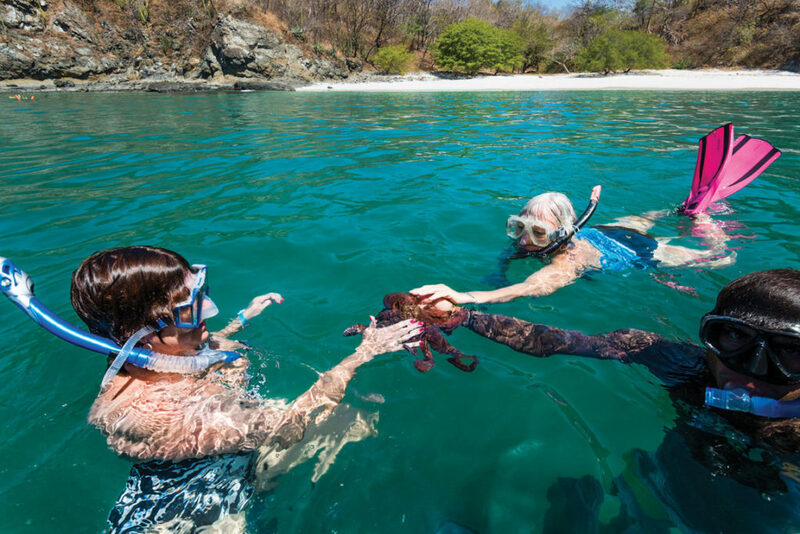 Tango Mar offers a wide variety of tours that enable you to discover the protected Nicoya Peninsula. 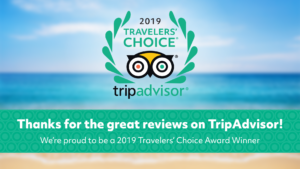 They include: horseback riding along the beach (to Montezuma), boat-tours through the Mangroves or to the nearby Tortuga Island (snorkeling), deep-sea fishing and scuba diving. 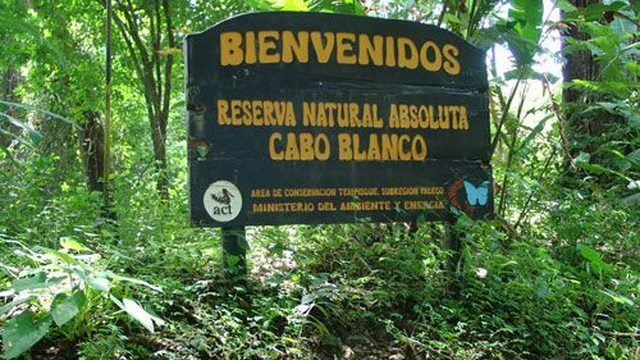 The natural wildlife of Cabo Blanco Strict Nature Reserve and Curu National Wildlife Refuge are nearby and guided visits can be arranged to learn about the flora and fauna of the area. 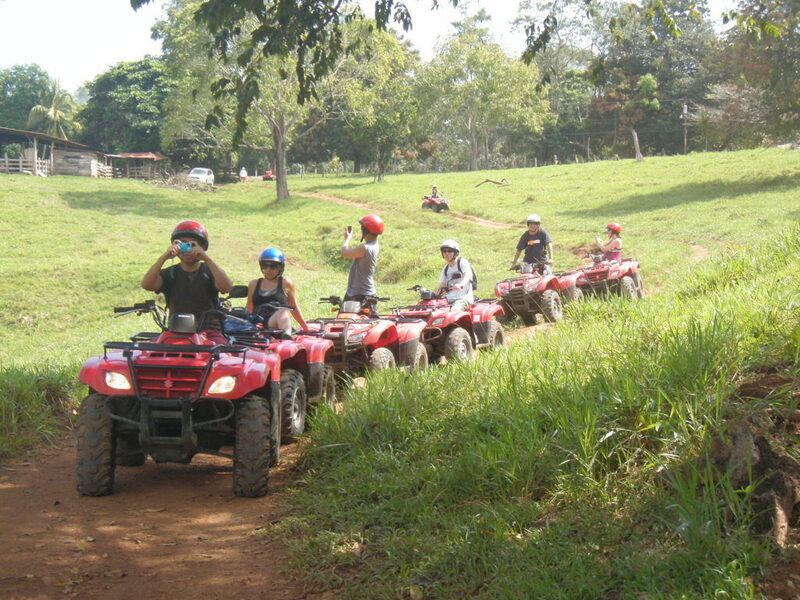 This trip is great for children, beginners and people who prefer a short ride. 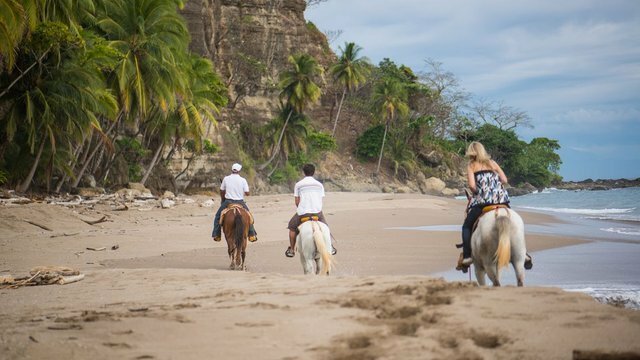 You lead the horseback riding wherever you want on the Tango Mar property and enjoy the flora and fauna of the Tango Mar Resort. You leave at approximately 8:30 a.m. from our stables. 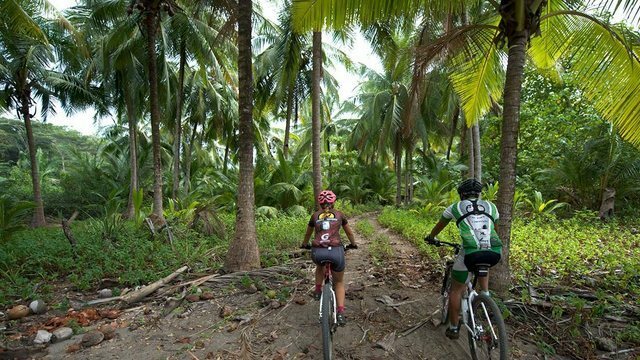 You ride along beaches and jungle trails and enjoy some great scenery and wildlife. This ride is suitable for all ages and all experience levels. You can make a stop in Tambor Village and enjoy a cool refreshment. You leave at approximately 8:30 a.m. from our stables (depending on the tide). Most of this ride is along the beach and some of it is through the jungle. This tour offers you some of the world’s best beach riding. 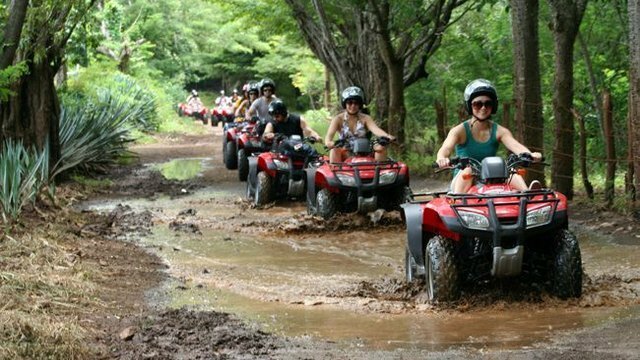 You will ride through the Montezuma Absolute Reserve and will be able to make several stops along the way. your camera and some money for personal needs. On Sundays our horses have their day off ! 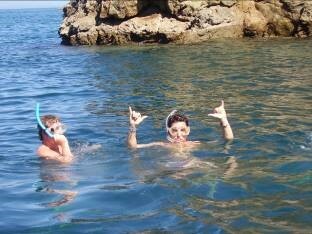 You will arrive at a gently sloping beach located in its picturesque cup-shaped bay of warm and soft waters. 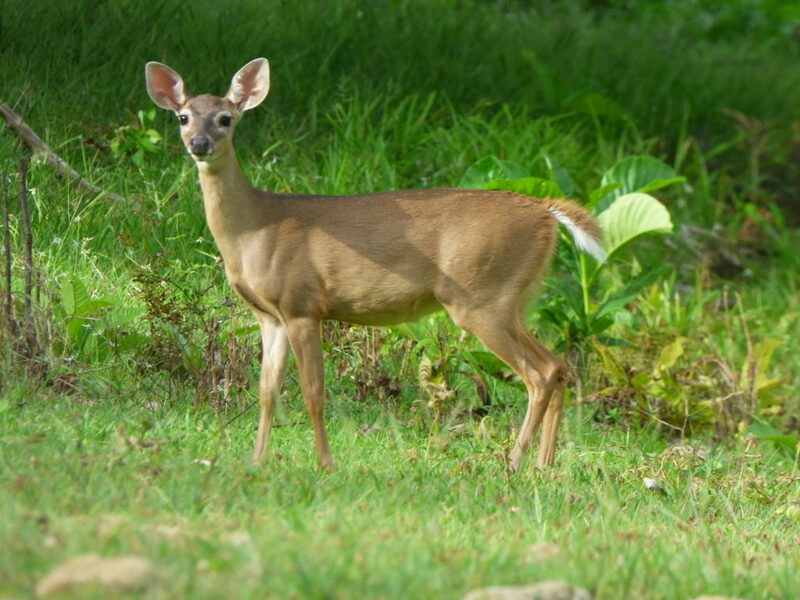 On the reserve you will hike through trails swarming with wildlife in all forms. 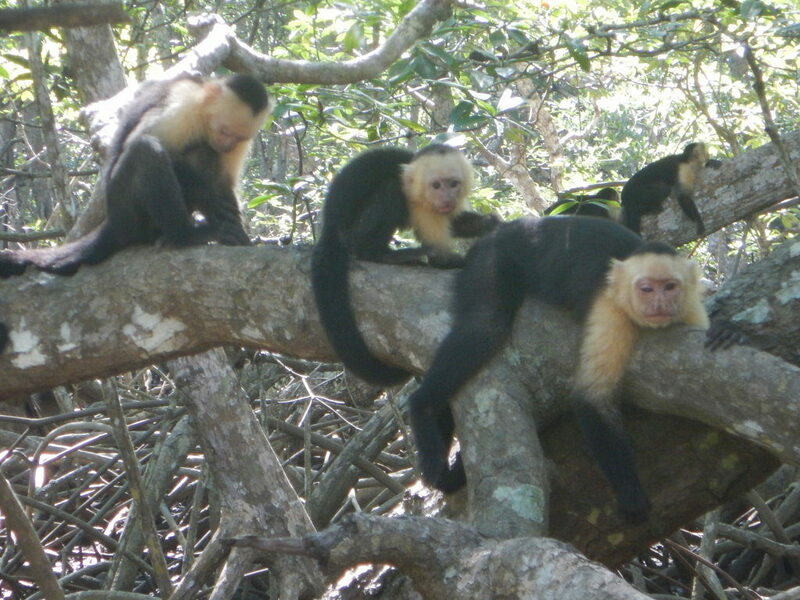 Curu is the only place in the peninsula where is possible to find the Spider Monkey, as well as over 200 hundred bird species. 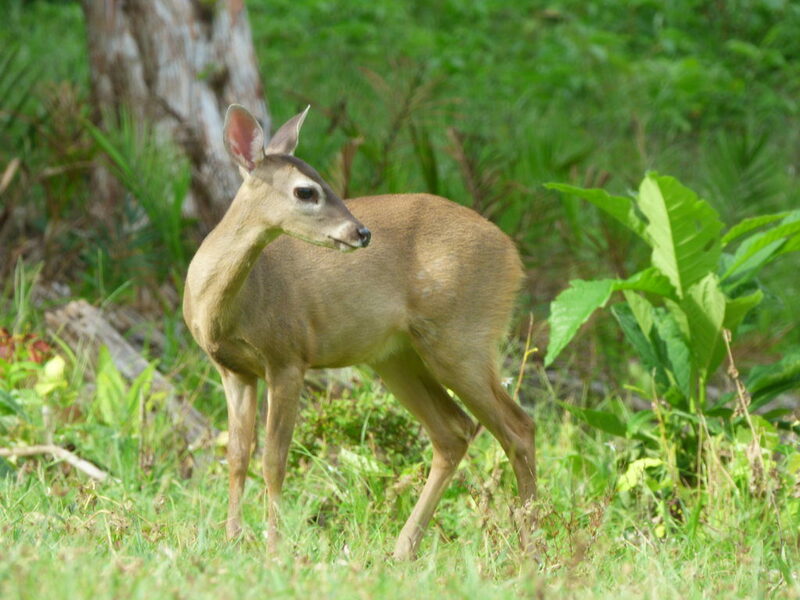 It’s also possible to see whitetail deer, coatis, anteaters, howler and cappuccino monkeys and iguanas among many, many others species. 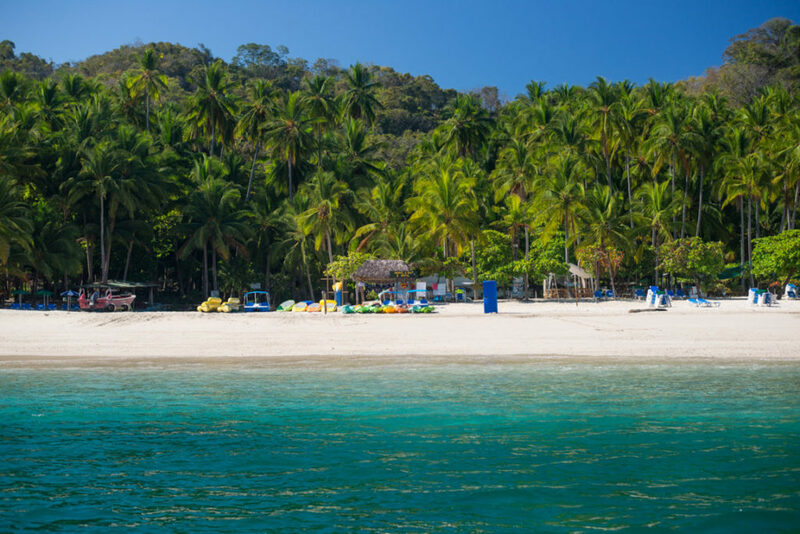 To swim on these tropical warm waters will make you feel revitalized. Federico Schutt established the Curu Hacienda in 1923. In 1974 squatters who settled in today’s Valle Azul occupied part of the Hacienda. Concerned about the human impact on nature, the Schutt family applied for the “Protected Forest” status for the remaining forest and mangroves. Additionally the Wild Life Reserve was created in 1983. 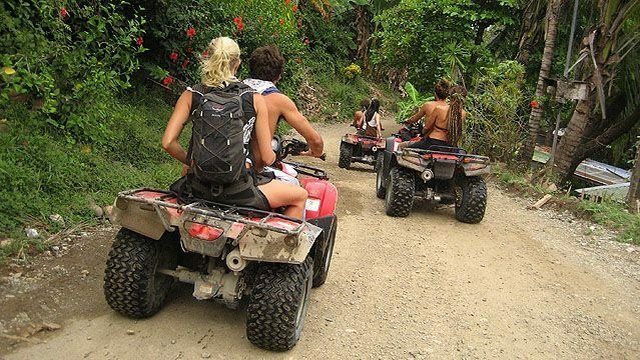 Discover Cóbano by paths well known only for our guides and feel the breeze over the sandy beach of Tambor in this exciting and unforgettable guided excursion. 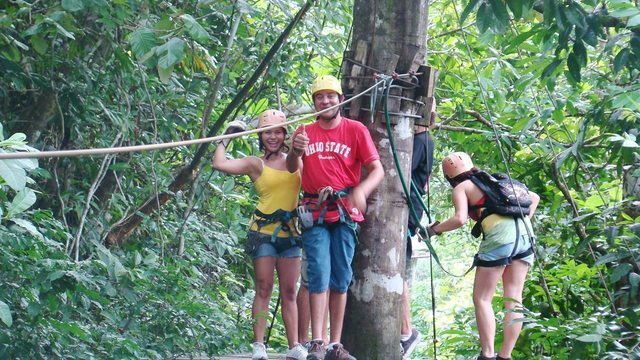 Explore Pánica’s mountains as much as it’s precious waterfall, and enjoy the beauty of the tropical forest. 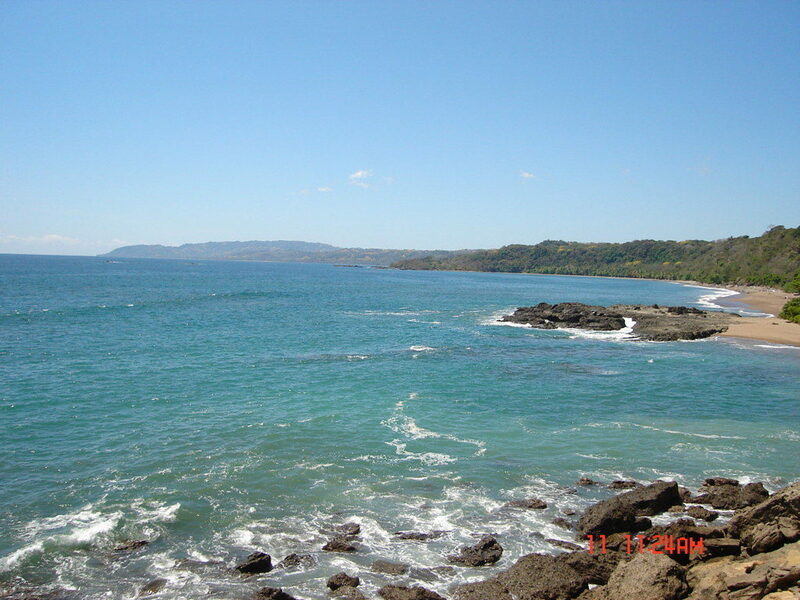 In our four hour tour you will also visit the town of Montezuma, where you can relax while enjoying the ocean breeze. 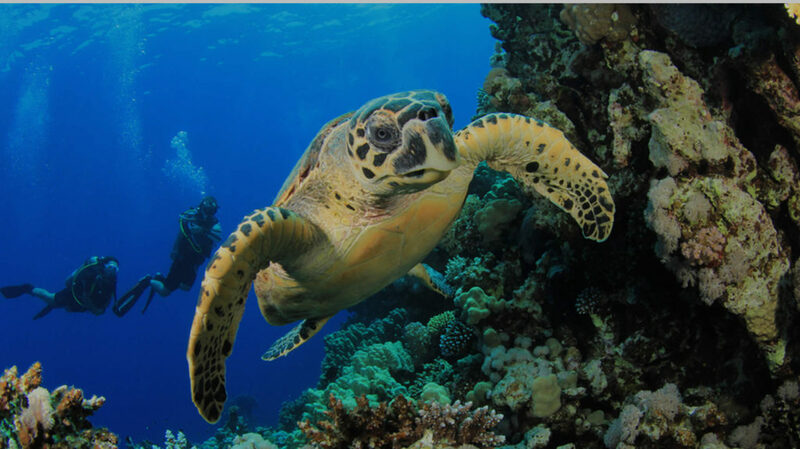 Visit the white sand beaches of the island and explore the magnificent coral reef nearby. 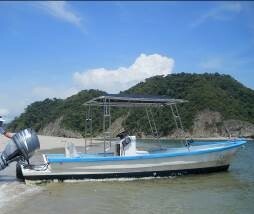 This trip will take you from Tambor bay in a Panoramic 20 minutes trip to the Tortuga Island. Once on the island enjoy its relaxing surroundings to sunbath or just lay around under the Almond and Palm trees. 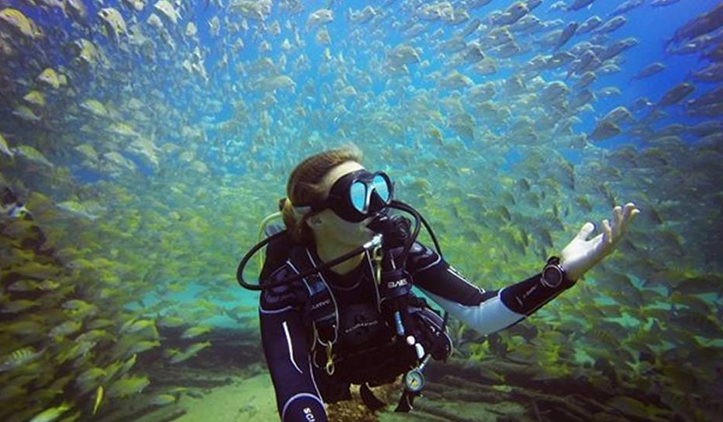 Some time after we’ll pick up our trip and go to snorkeling spot in the ocean where you’ll enter in contact with a stunning underwater world, inhabited by hundreds of varieties of fish and Corals with more vivid colors than words can describe. 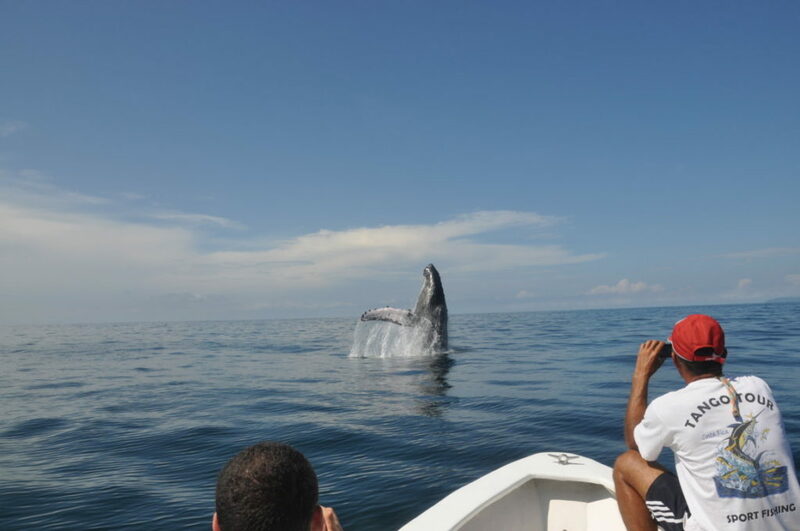 Humpback Whales, dolphins and Sea turtles can be sometimes spotted during this trip. 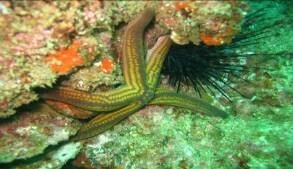 Don’t forget to bring your aquatic camera, sunglasses, tanning lotion and some money for personal. Sun lotion, your camera and some money for personal needs. 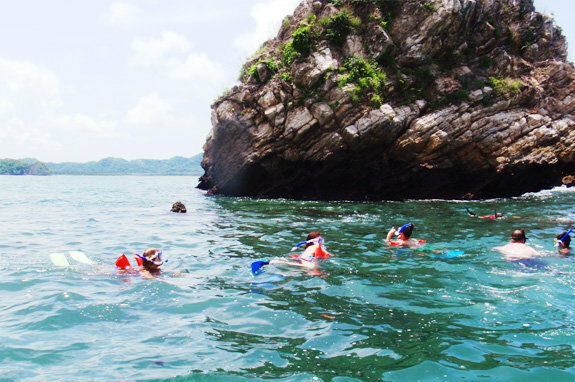 The diving sites are around Isla Tortuga on the south part of Nicoya Peninsula, works under PADI Internationals standards. Transportation Tango Mar Curu is not included. 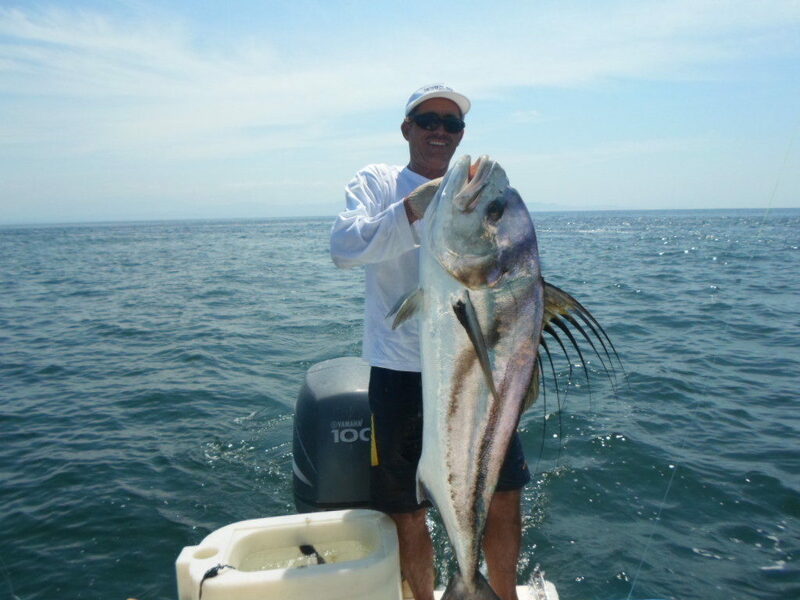 Costa Rica is a world renown fishing spot for the variety as well as the quality of fish you can catch. Even when there is no way of telling which you will catch, is hard to come back home empty handed from this trip. Hey! That’s fishing. 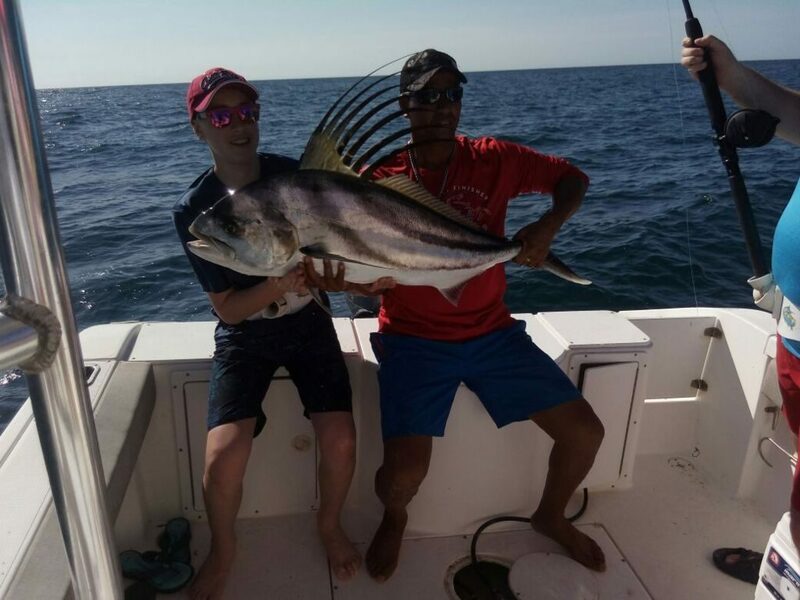 Our agreeable crew will work hard to secure you the best possible catch of the season. 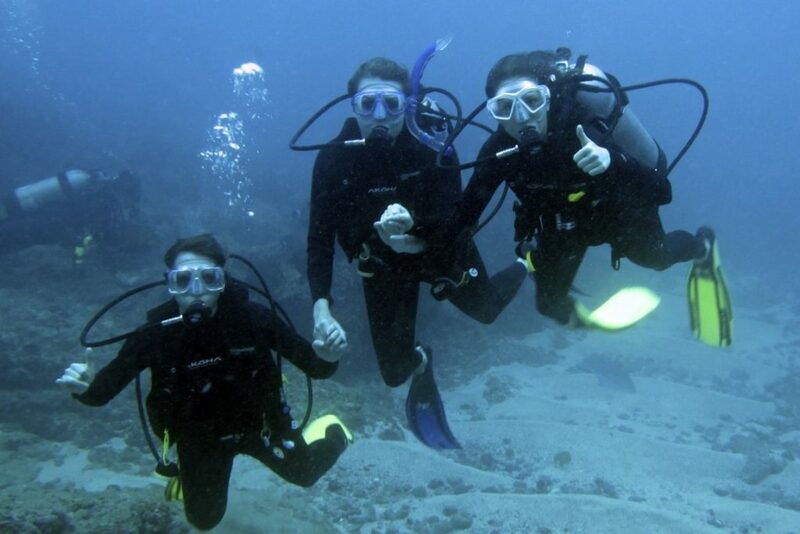 During this trip you will have a good chance to see dolphins, sea turtles and huge rays. Humpback Whales can be spotted between the months July and September, sometimes until November. 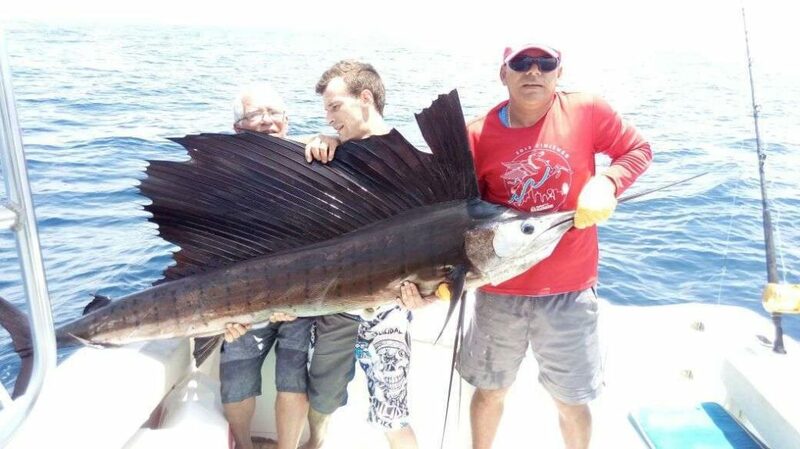 Costa Rica is renowned worldwide for the quality and variety of species of fish to be caught. 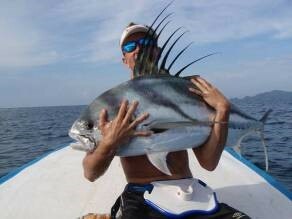 Although it is difficult to predict what might catch, it is difficult to return empty handed from this trip. But Hey! That’s fishing! 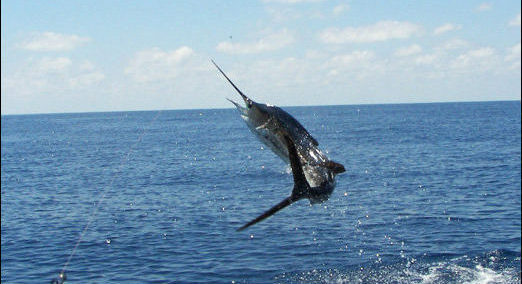 No doubt the experienced crew will do the best efforts to ensure the best fishing of the season. At the end, will visit a paradise and private beach for a relaxing time. Capacity for 4 people fishing all the time. 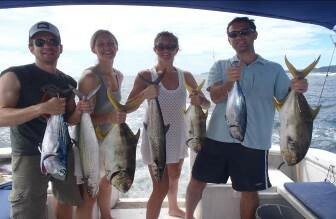 This 7 to 8 hours trip takes you on an exciting all-day fishing expedition. 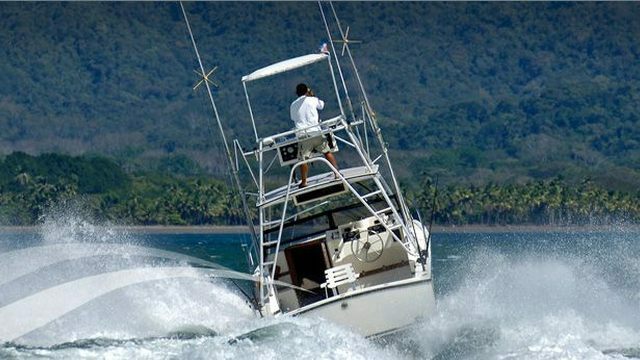 11 to 30 miles out you will fish for Marlin, Sailfish, Dorado, Wahoo, Tuna and Mackerel on one of the modern twin-engine sport fishing boat completely equipped with the latest in sport fishing gear. Up to 4 passengers. 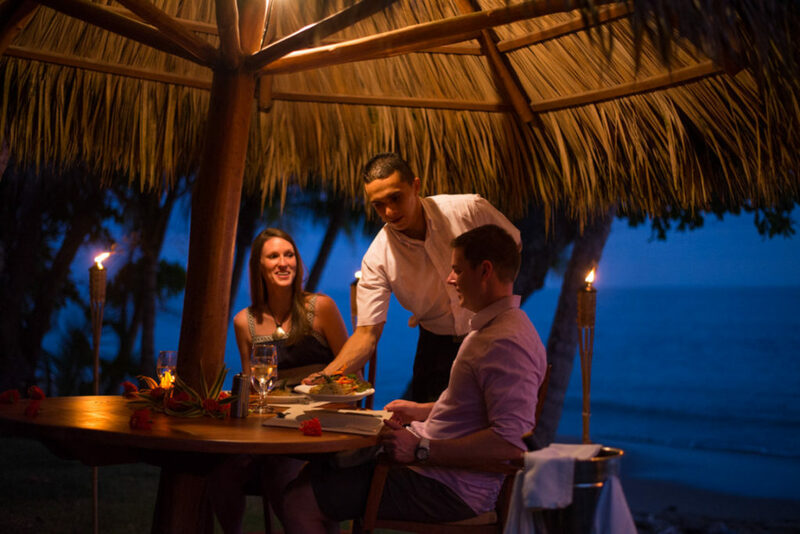 We’ll be happy to prepare you a delicious dinner with your catch. 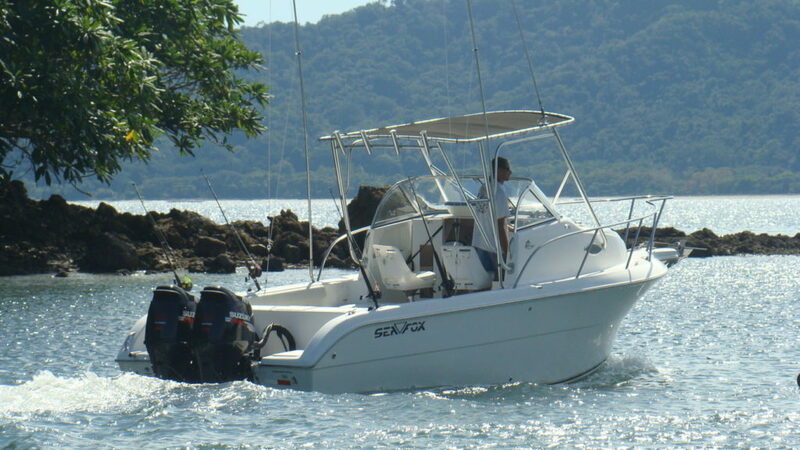 Capacity for 4 people fishing all the time, but it can take up to 5 adults plus crew. It was here where due to the initiative of a Swedish citizen, Nicholas Wessberg and his wife Denmark citizen Karen Morgensen, that the world famous Costa Rican national park and protective areas system was born. The visionary project turned about 1,250 hectares of pastureland with an initial 15% of primary natural forest into a strictly protected area. This allowed the hitherto depleted pasture lands to regenerate, with minimal human aid and mostly through natural means, seeds being dispersed by wind and carried by water or animals expanding their habitats, serving the original uncut forest as genetic bank. Today that 85% of pastures land are a secondary forest in process of equilibrium. Don’t forget to bring your camera, hiking shoes, long pants, sunglasses, sun block, a hat and money for personal needs. The tour leaves from Tango Mar 35 minutes driving you will get to Montezuma Village, then our driver will lead you to the first of 11 platforms, nine cables, for you to experience a unforgettable adventure, take a look at the unique wildlife & birds up in the trees. There is a so much nature to see and enjoy, and a great adventure, also!. 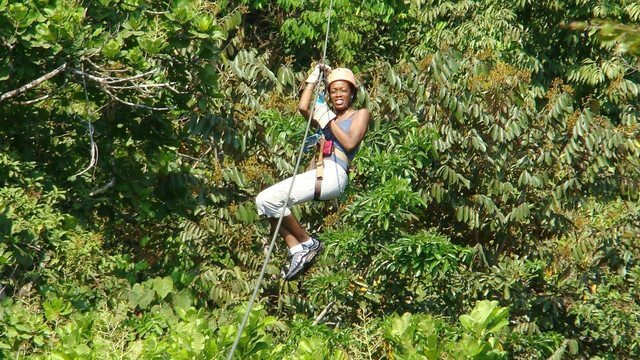 The tour includes transportation and the canopy fee. This tour is not recommended for children under 9 years. Departure time: 8:20 am, 12:20 pm and 2:20 pm. 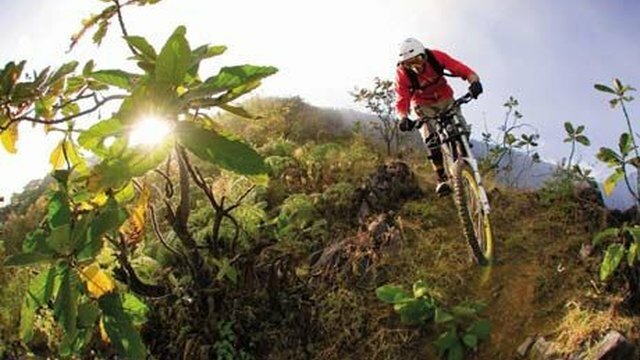 Explore and discover the beauty of this area with our modern mountain bikes. 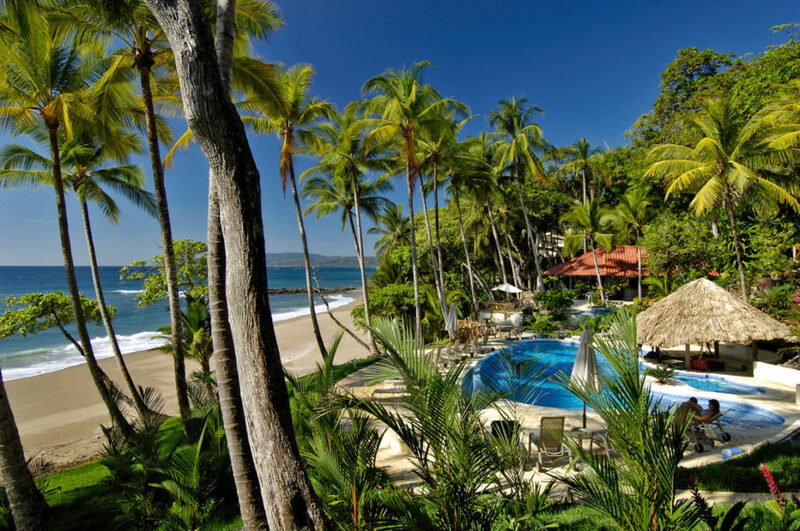 You will enjoy the landscapes and the beaches surrounding Tango Mar while you exercise. Dare yourself and enjoy this different and healthy experience! Enjoy a guided tour from different paths of Tango Mar´s property. 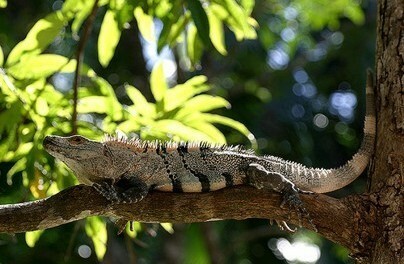 You will find an abundance of wildlife (birds, reptiles, howler monkeys, butterflies and insects) and an exuberant flora as well. During the tour you will visit Tango Mar´s viewpoint which is unique in this area because you can appreciate a magnificent view. You will also visit our organic garden where you can see different types of herbs, vegetables and fruits all of them are use to prepare some of the dishes for our both restaurants. 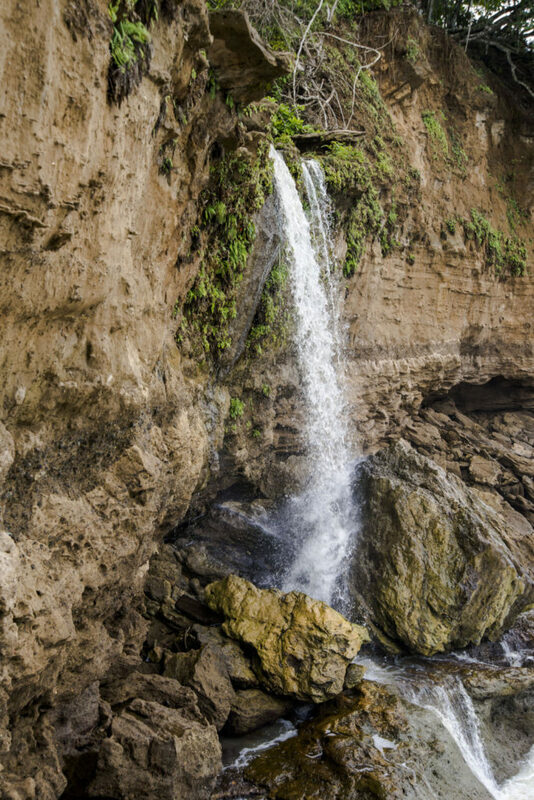 At the end of the tour you will visit the waterfall which is called “El Chorro (The Stream)”, 8 meters high with spectacular views and the particularity that is one of the 7 waterfalls in the world ending directly into the sea at high tide. Minimum: 4 persons / Don’t forget to bring a bottle of water! Departing from Tambor bay the first stop is Curú Wildlife Reserve. 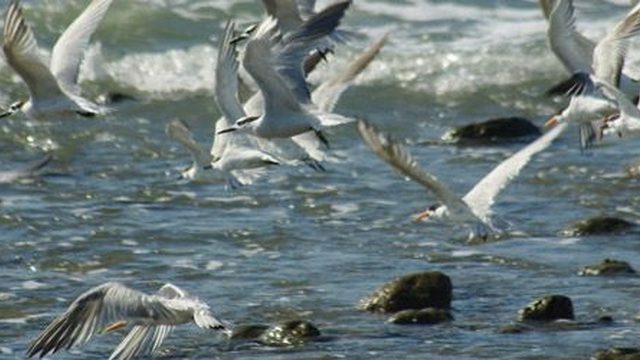 A family owned protected area boasting wildlife blended in its many different habitats in one small area. Walking its trails you will be able to appreciate virtually thousands of varieties of plants and trees and hundreds of species of animals. 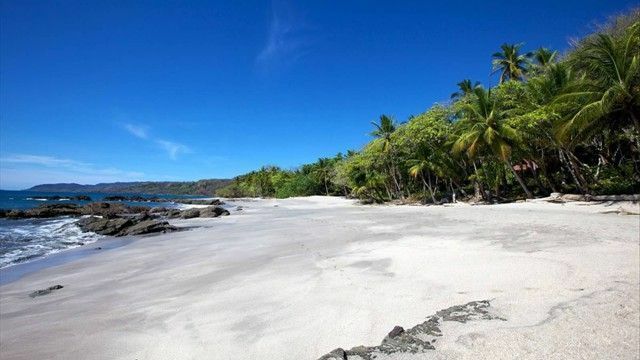 Next you will visit Tortuga Island, where you can relax and enjoy its white sandy beaches. 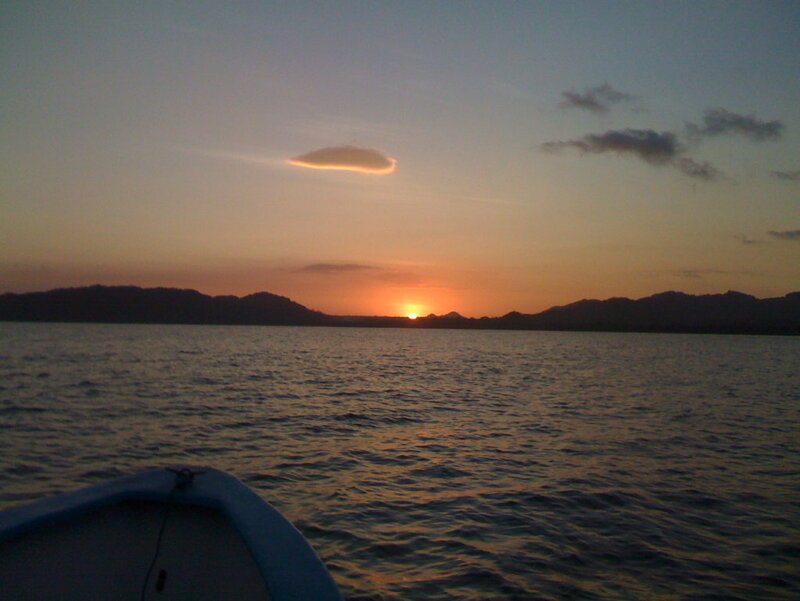 If you are more active you might want to rent kayaks or other type of water sport equipment available at the Island. Romanticism never goes out fashion, let go and come aboard. 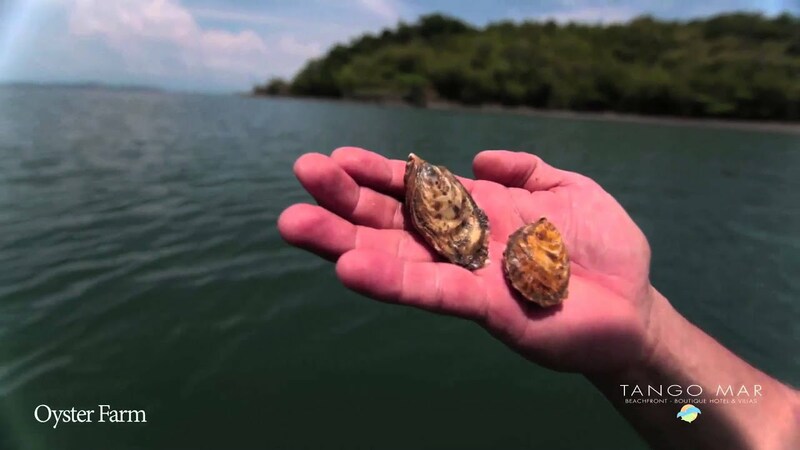 A boat will be taken in the afternoon at the scenic Tambor bay, bathed in soft glowing light. It will take you across the bay, letting you grasp the beauty of the mountains that surround it, to finally reach the Pochote River’s Delta where the mangrove rests. PRICE PER COUPLE $ 180 with Champagne of the house. Tour by car the Peninsula beaches. The south of the Peninsula features some of the most famous and beautiful beaches of the north pacific. This tour will take you through back roads and many little towns around the area. 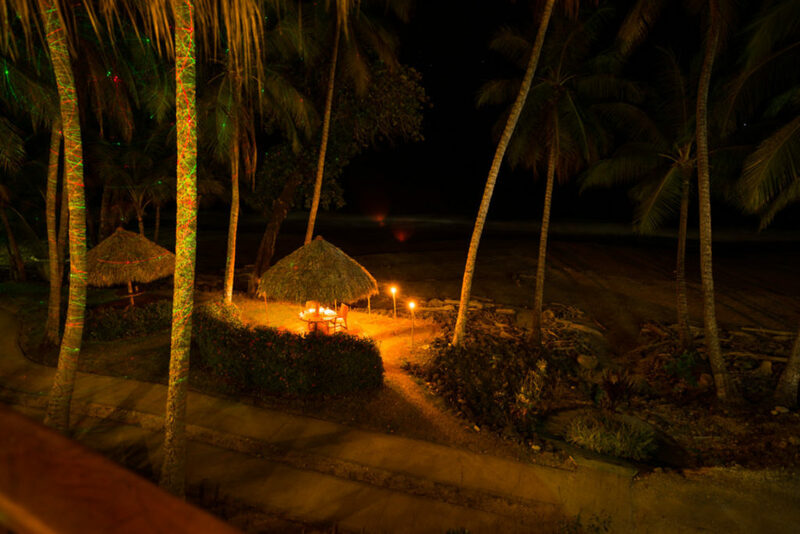 The names Montezuma, Santa Teresa and Mal país are common to those who love the laid back & ´laxing groove of surfing. 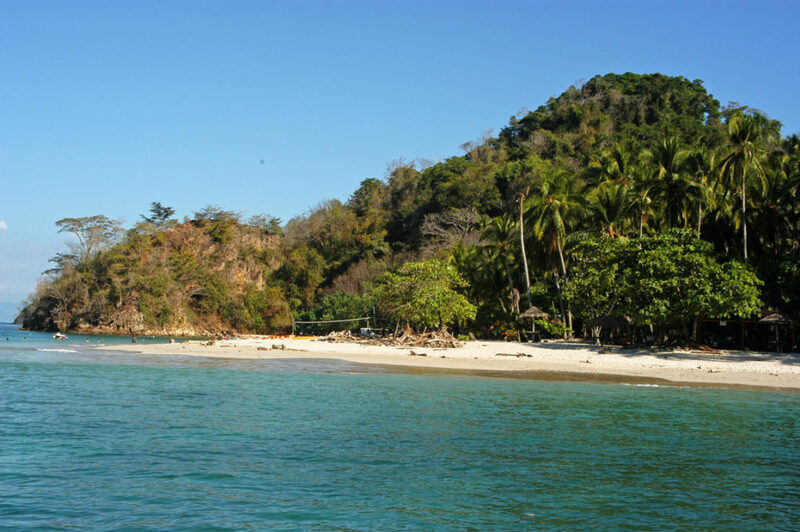 The beach of Montezuma is located right at the town of the same name, a well known place in the world for its laid back, off beat life style. 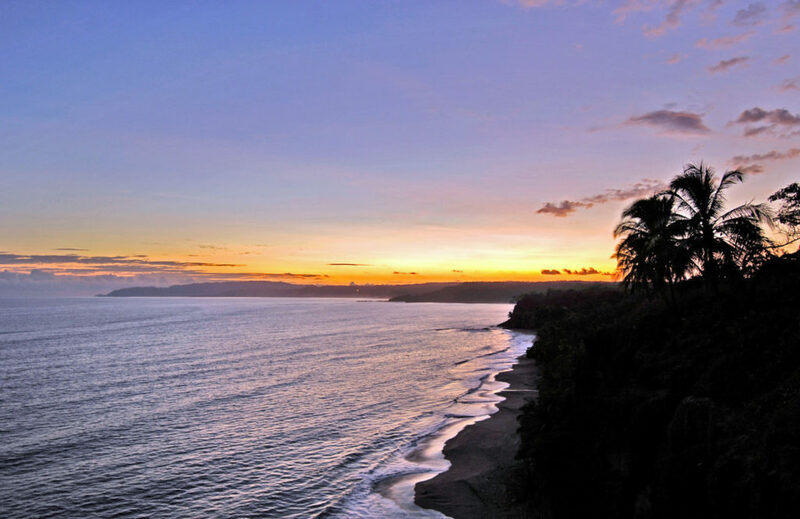 Mal País and Santa Teresa are world-renowned surfing spots where you can witness the most beautiful sunsets at their paradisiacal long stretched shores. Playa del Carmen is located right in the middle of this two and is often mistaken as part of either Mal País or Santa Teresa. Its beauty and excellent surfing conditions are the cause of this mistake.